It’s like Disney World for classic film fans. Rushing from place to place and waiting in lines for entertainment. 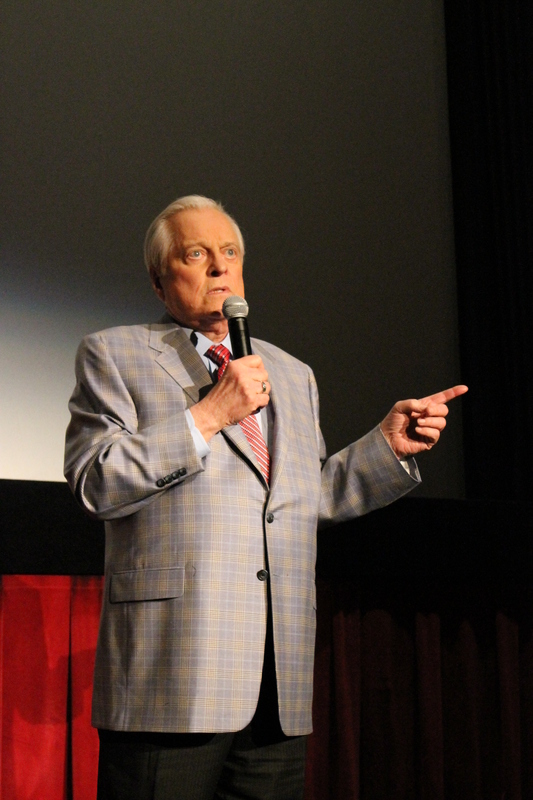 Turner Classics Movie’s Robert Osborne could be considered the “Walt Disney” of the whole event. Yes for classic film fans, the Turner Classic Film Festival (TCMFF) may be considered the “happiest place on Earth,” where thousands of people spend four days doing nothing but watching classic films and enjoying each other’s company. 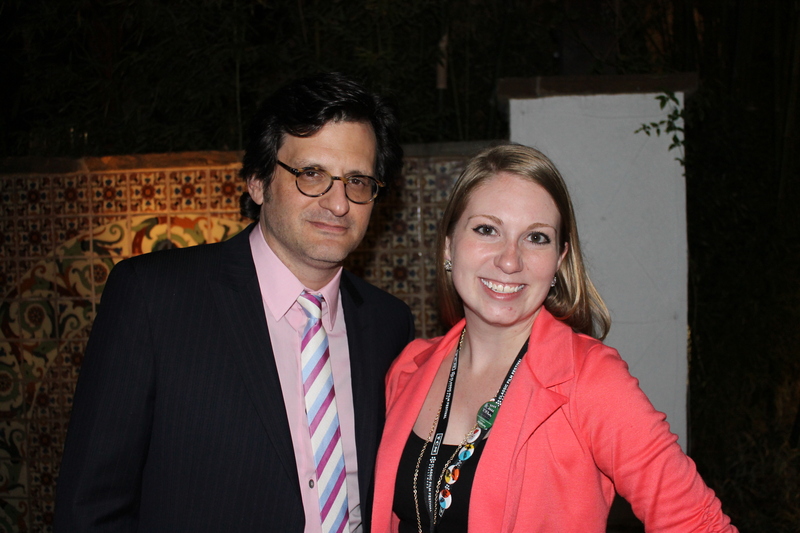 Since this was my first year attending TCMFF, I can’t compare it to past years but several have said it was the best year ever, and I would believe it. After three years of wanting to go to TCMFF, I was not disappointed. I had a ball. I visited Hollywood once before in 2006 on a family vacation and was left rather dismayed by the disregard of history and confused by the odd people dressed like Marilyn Monroe and Shrek outside of Graumann’s Chinese Theater (now TCL Chinese). But even those people desperate for attention in their costumes and passing out their CDs didn’t cheapen TCMFF. In fact I felt like I excitedly drifted along on a cloud of old Hollywood splendor; only thinking about which movie I would watch next. And after years of being a classic film fan I was finally with people who understood what I was talking about. I could toss around names like Van Johnson, Edward Everett Horton or mention the slang “pre-code” and every one knew exactly what I meant. It’s an uncanny feeling to be sitting in an audience waiting to watch “Libeled Lady” and have the audience applaud when stars Jean Harlow and William Powell enter on screen. I haven’t seen many classic films on the big screen and it’s a special experience. Not only did I realize how much I liked some films, but I noticed more. Facial expressions and shifting of eyes that you may miss on the small screen. Though I blogged each night on my phone, I wanted to do one last review of the festival. 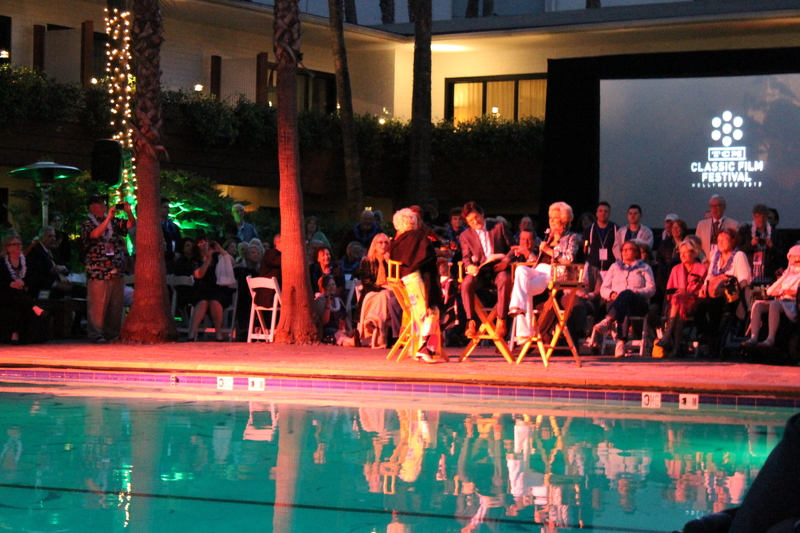 The film was shown poolside at the Roosevelt Hotel and hula dancers performed before the film. 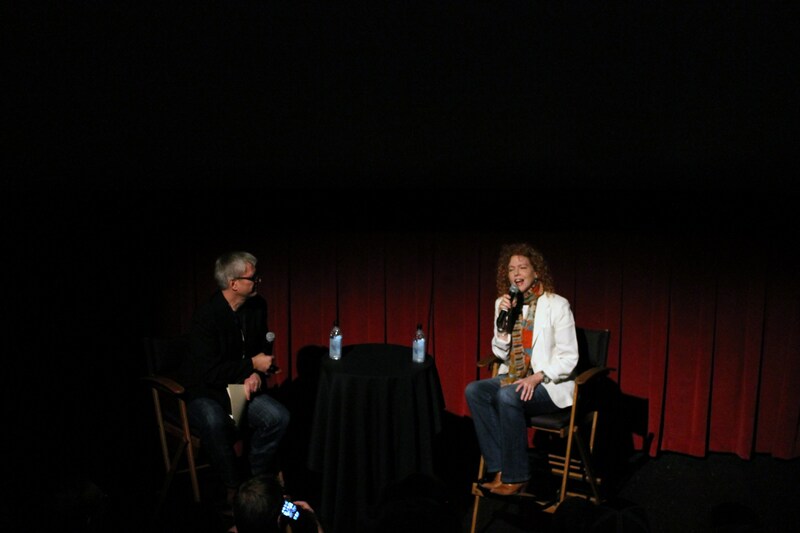 “Screwball comedy is a lost art,” said TCM’s Scott McGee before the film. The whole audience also cheered as McGee said he was a huge fan of William Powell’s. Starring Paulette Goddard, Fred MacMurray, MacDonald Carey. Introduced by MacMurray’s daughter Kate. MacMurray’s daughter shared wonderful stories about her father including: MacMurray, a saxophonist and also once a singer for a jazz band, played the saxophone for the My Three Sons TV show theme song. This was my first silent film with a live orchestra accompaniment. “Clara was a great natural talent of movies,” said Bow biographer David Stenn. -Hondo (1954) starring John Wayne and Geraldine Page Introduced by Leonard Maltin. This was my FIRST EVER 3D film. Very clever of TCM to start a Saturday with cartoons. Leonard Maltin introduced the cartoons saying how Warner Brother’s cartoons were the first to have the characters talk at the screen. -Alfred Hitchcock’s A Lady Vanishes (1936) Introduced by 98-year-old actor Norman Lloyd. Lloyd gave up a tennis game to speak before the film and said A Lady Vanishes and 39 Steps were the last two English films Hitchcock made and were both perfection. “I tell film students, don’t go to film school. Just watch 39 Steps,” Lloyd said. A film that had not been shown over 50 years due to copyright, this was my 500th musical that I’ve seen. 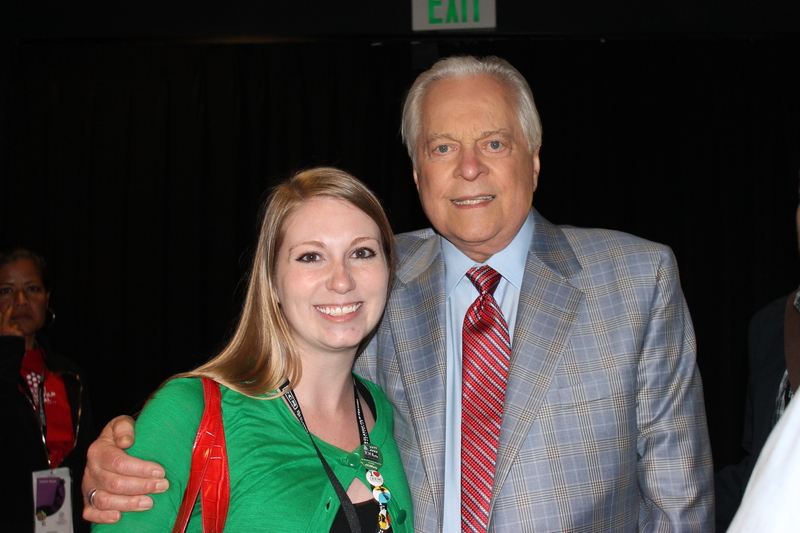 It seems fitting that my 500th musical would end with me meeting Robert Osborne afterwards. “I have nothing but wonderful memories of Joan,” Blyth said. I love that TCM also ended nights with a horror film at midnight. -It Happened One Night (1934) starring Clark Gable and Claudette Colbert. A special screening because it was the second to last film to be shown in Graumann’s before being remodeled to IMAX. The crowd booed when Osborne announced this. Along with the films it was a pleasure to meet so many fellow bloggers and Twitter pals in person. Especially since I have talked to many of you for three years. There were screams of excitement and embracing as we kindred classic film souls finally met in person. 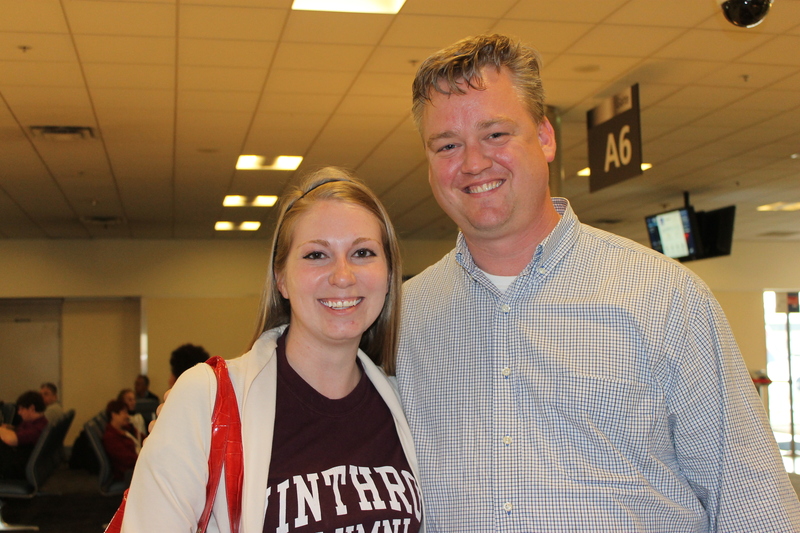 Sad to be returning home, I ran into TCM’s Scott McGee who was on my flight home! My favorite day of the Festival was Friday since it held so many firsts for me. Now, as I sit on my couch back in North Carolina, I can only count the days until next year. This entry was posted in Turner Classic Movie Film Festival and tagged Ben Mankiewicz, Robert Osborne, turner classic movie film festival, Turner Classic Movies by Jnpickens. Bookmark the permalink. Raymond, I’m in Greensboro! 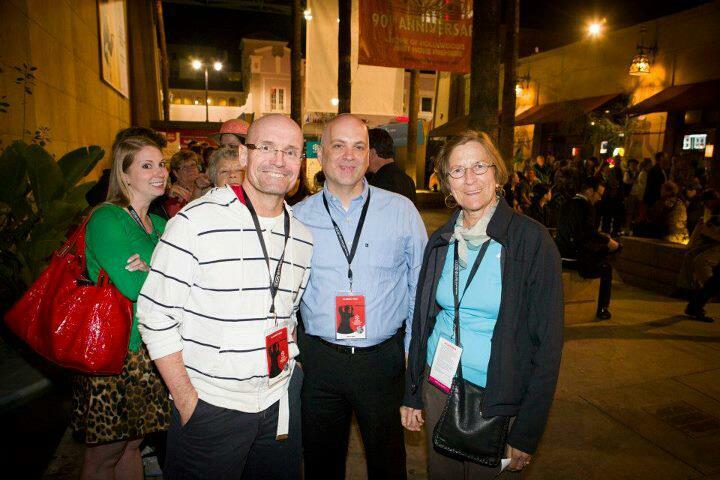 Good to see another TCMFF attendee from NC! Nice write up. New title image? Looks nice. What wonderful movie selections and what wonderful memories. Really enjoyed reading these, Jessica. Thanks for sharing your memories with us. Saw you running around the multiplex at this year’s festival and looked up your old blogs. I’m in the picture you photobombed outside the Egyptian. That’s me in the blue shirt. Nice blog. Keep it up! I almost said hi to you in One Potato, Two Potato saying I was the “photobomb” girl. That photo makes me laugh (hopefully it makes you laugh too). Thanks for dropping me a line! We’ll have to talk next year.